QAT works as your safe drawer that keeps your favorite features easy to reach out. By default, it has Save, Repeat, Undo and Start from beginning commands. You can customize and add more of your favorite features in QAT by clicking on the dropdown button and selecting ‘More commands’. Sometimes, when you’re working with SmartArt, you wish to move the art, which is possible with shapes. Well, you can easily convert SmartArt to shapes by doing a right-click on your Smartart and selecting Group > Ungroup from the list of options. With this option, you can initiate with SmartArt and enjoy the freedom of shapes. There isn’t anything more painful than losing the presentation you put in efforts for and realize that you didn’t save it. Well, if you know how to recover unsaved presentation on PowerPoint, it is never too late. Just go to File > Open and there you see the list of saved presentation in the right-hand side. You need to scroll down the most to see the best thing named as Recover unsaved presentations. When you’re presenting a slideshow which has couple of complexed data or charts, you might want to zoom in. It becomes difficult for everyone to see the information you’ve worked on. To zoom in at a particular space of a slide, you can move the mouse and click the magnifying glass located at the bottom. It enables the zoom function and then you can click anywhere on slide to zoom in. You can use the arrow keys or hand-tool to navigate within the slide. Use Esc key to get back to normal. It’s true that shapes look way better than tables, and one of the best hidden features of PowerPoint lets you convert the tables into a group of shapes. To do this, you need to select the table and copy it. Then use the Paste Special command and select Picture (Enhanced Metafile) from the list. It should paste the table as it was in looking. Do a right-click and select Ungroup, followed by a click on Yes at prompt box. Now the table that you had, would’ve become a shape that you can customize. 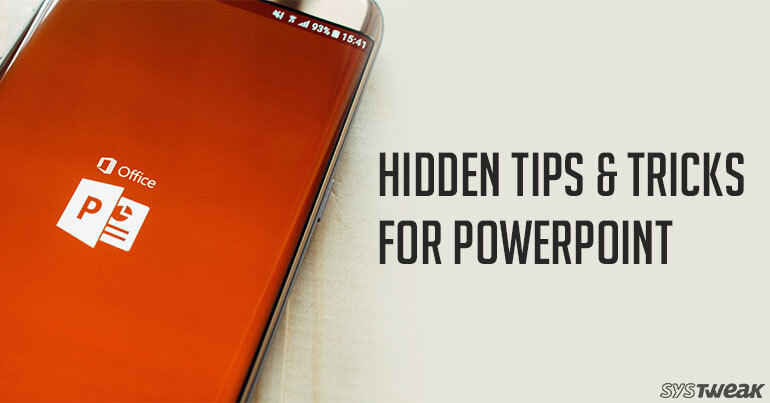 Overall, you may not have used and practiced the above hidden features of PowerPoint, but they are very handy. Now you can use them to make your presentation look even more attractive, that too in a lesser time.